The intent of this post is to share both my experience with Steam Greenlight as a solo dev and the data from that experience. I am happy to share more data if I have it. Oh, the wild ride that is Steam Greenlight! Fracture the Flag is the result of twelve months worth of my spare time. It’s the first and only game that I’ve made. I have a full time job that pays well enough, but why not swing for the fences with Steam Greenlight and see what happens? Maybe I could upgrade the office? Or buy a new mountain bike? And I’d be competing with things like the “Toilet Simulator” so how hard could it be? Being cautious and curious I setup a Steam Concept page, just to see what would happen. I knew the traffic would be a small compared to a true Greenlight page would be, but it still seemed worth my time - and it was. For the first few days the Concept page was getting 4-7 hits a day and almost entirely “yes votes.” Even that small trickle of traffic died down after 4-5 days. Now almost 3 months in only 90 people have visited and a bit over 30 of those have voted the game up. This resulted in a fantastic yes to no ratio of 97%, but not much else to get excited about. My stats matched up with Quiver of Crows data which was Greenlit back in January. I was feeling cautiously optimistic. I put in some more work, finished a second level that was, in my opinion, better looking and more interesting than the first level that was featured on the Concept page. With this and a few other visual details added I put together a second and updated game trailer. Once the small fee had been paid and the page was setup I was terrified to push the publish button. I double and triple checked the screenshots and that the video played. Was everything as good as it could be? No. Did I know how to make it better? Nope. The first few votes came in. Oh no... Way more no’s than yes’s. Not good. It's over. Next game? I took a deep breathe and the tide changed. Over the next few days the number of yes and no votes started to even out. I obsessively checked the page, cheering when yes’s came in and responding to thoughts or criticism in the comments. As a side note: as the number of comments increased so seemly did the ratio of yes’s to no’s. Interesting. 24 Hours into the campaign the yes/no ratio was at 44% yes's which was well above the meager 31% of the average top 50 game! I was starting to get excited! I also began to wonder “How does a game make it to the top 50 with only 31% yes votes?” Wow! How can you drive that many people to your page that aren’t excited about your game? Send a few my way? By the end of the second full day the yes and no votes had evened out - each at 48% of the total votes cast. This was a pretty good boost to the ego. I’m a first time solo dev working in my spare time and I’m doing better, maybe a lot better, than the average! These “great” results continued through day 6 of the campaign. Breaking into the top 100 on day 4 and getting more yes votes than no votes! I’ve never played a full round of golf in my life, but I know what a dog leg looks like... And it looks like the bright green line in the graph below. Unbelievable how quick the spigot of visitors shut off. The page went from 600+ visitors a day to less than 50! On day 6 I got almost 300 yes votes. On day eight I got 6 yes votes (no typo there). 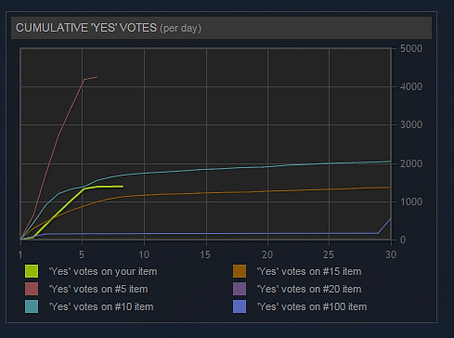 Judging from the incredibly hard to figure out and ever changing “Cumulative ‘Yes’ Votes” graph this is not uncommon and is pretty much the norm for all but the top 5 or 10 ranked games. It’s not a flawless, but I can see that perspective. I'm not sure what's next. I am torn. One minute wanting to move onto the next idea. After all I've learned so much over the past two years. The next minute I still believe in the game... After all its been 8 freaking days! What could I possibily expect? Fracture the Flag is currently bouncing around in the mid 80's in the rankings. Not bad. Only one round of games has been greenlit since the game hit the top 100. So there is hope, plenty, if I'm honest. So I don't know. No pity party. Just lack of certainty. Its been a rollercoaster to say the least. I'd all but given up. I was ready to make the next game. I was on the road to a bike race and got the email that FTF had been Greenlit! Wahoo! I apparently forgot to take screenshot when FTF was Greenlit so the image below is 9 months after the fact. The votes don't change after a game has been Greenlit but the vistors and followers still do. As with many other people I am stunned by what gets submitted to Greenlight. After all Fracture the Flag was in the batch of games with the “Toilet Simulator.” We can speculate all day long what the point was, but that developer got way more action than I did - I bet the Toilet Simulator guy isn't talking about me! When I see games like the “Grass Simulator” for sale it makes me want to cry a bit. I know my game is better and I suspect most people, or at least 48%, would agree with me. At the end of the day I’m glad that Valve is making the decision not purely based on numbers, but the process is still mysterious. 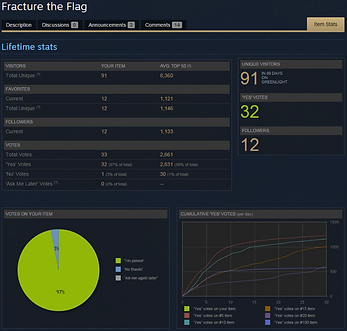 When Fracture the Flag was floating between 91st and 93rd on Greenlight the 92nd ranked game was Greenlit… Ouch. From what I’ve read, and deduced from the stats, Fracture the Flag will continue to slowly march up the rankings. 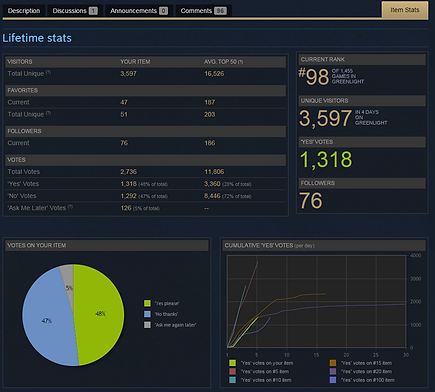 It jumped to 83rd once a handful of other games had been Greenlit. It seems likely that eventually the game will be given a thumbs up. If the day ever comes that Fracture the Flag is Greenlit I will no doubt be ecstatic! Until that day comes I'm on the slow part of the rollercoaster hoping for one more loop da loop. There are a few things that I wish were different. The first would be for some criteria to kick games off Greenlight. Maybe after 2-3 days you need a certain yes/no ratio. Or maybe during those first few days you need to get a certain number of yes votes per day. Something needs to be done to quickly filter the total crap that folks are submitting. Getting “voted off” and then having to wait before resubmitting seems like it would solve many of Greenlight’s problems. The second would be the waiting. Many if not most games in the top 100 experience the dog leg or drastic slow down in votes. If games are only getting 10 or so votes a day and (judging by the data) that will eventually push the game into the top 20 overall then why wait to Greenlight them? If 48% of the voters and 36% of the people who saw my page said they’d buy my game then isn’t that good enough? Or maybe bad enough that you pull the plug? It seems everyone has a plan to “fix” Greenlight that removes the crap but allows their own game to get Greenlit… Maybe I'm just one more of those guys.